Happy Easter to everyone that celebrates! We will be attending a family dinner which will also give people a chance to say goodbye to my youngest son before he moves across country. It will be California style, which means a barbeque. My Midwest roots demand a ham this time of year so we’ll have that next weekend. 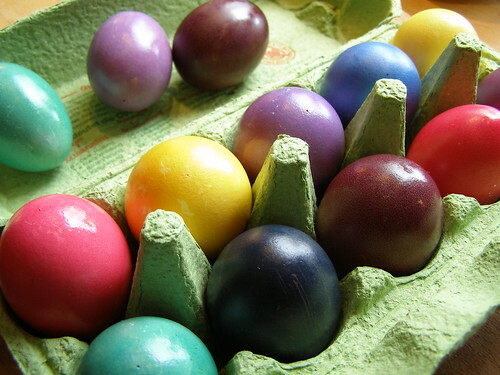 How did bunnies and eggs get tied into the celebration of Christ’s resurrection? In a follow up to my email being hacked, I wrote an article on better password practices at Couple Money this week. I hope you click through and make sure you’re being secure online. Who couldn’t use a $50 American Express gift card? Enter at Cash Money Life by April 29th. If you want to learn another language, check out the giveaway for Mango languages at Buck Inspire. The contest ends May 5th (I wonder if it’s a coincident that it’s Cinco de Mayo?). If you didn’t win my giveaway and still want to read Debt Free for Life, enter the giveaway at Enemy of Debt. Entries are accepted until midnight tomorrow. Some rights reserved by erix! Hola! Cinco de Mayo. Didn’t plan it that way, but very observant of you. Gracias for the mention!